Do you need to write a business letter? Not sure about the best layout to use or what to include in your letter? It's important that all the business letters you write are properly formatted and professional in appearance. If the letter isn't formatted correctly, doesn't have enough space between paragraphs, and uses a non-traditional font style or size, it can reflect poorly on you. Here are guidelines for writing a business letter, so all your correspondence makes the best impression. Business letter margins should be about 1" all around. This gives your professional letter an uncluttered look. You should align your text to the left; this is how most documents are aligned, so it will make your letter readable. Leaving space in your letter creates a clear, uncluttered and easy to read look that the reader will appreciate. Your letter should be in block format: the entire letter should be aligned to the left and single-spaced except for a double space between paragraphs. The traditional font size for a professional letter is 12. The font should be Times New Roman or Arial. However, if you are using letterhead, the letterhead may be in different font size and style. There is no need to use different styles within a professional letter. Use a uniform font (book print font such as Times New Roman or Arial) and avoid underlining, italicizing, or bolding. However, if you are using letterhead, the letterhead may be in a different font style. Business letter text should be clean and readable. Avoid writing your letter in one large block of text. Break your text into several concise paragraphs. These paragraphs should be aligned to the left; this allows for easier reading. When you have completed your letter, ask someone else to read it for you. Have them glance briefly at the letter. Is there too much text on the page? Is it easy to see the distinct paragraphs? The first section of your letter should include your contact information and the contact information of the person you are writing, too. Also, include the date you are writing at the top of your letter. Unless you know the reader well and typically address them by their first name, you should include the person's personal title and full name in the salutation (i.e., "Dear Mr. James Franklin"). If you are unsure of the reader's name, include his or her title (i.e., "Dear Executive of Marketing"). If you are unsure of the reader's gender, simply state their full name and avoid the personal title (i.e., "Dear Jamie Smith"). If you are unsure of the reader's gender, name, and title, simply write, "To Whom It May Concern." Leave one line blank after the salutation. Professional letter paragraphs should be relatively concise. The first paragraph may include a brief friendly opening and a concise explanation of your reason for writing. The second paragraph (and any subsequent paragraphs) should expand upon your reason for writing. The final paragraph should restate your reason for writing and, if applicable, state your plan of action (or request some type of action be taken by the reader). 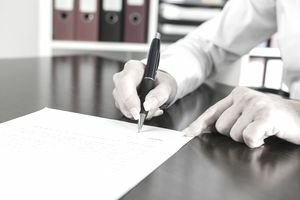 When you're writing a business letter or email message it's important to close your letter in a professional manner, so you're letter, in its entirety, is well-written and professional. When you are sending a paper letter, finish the letter with your signature, handwritten, followed by your typed name. If this is an email, simply include your typed name. Finally, don't forget to spell check and proofread your letter before you send it. Again, ask a family member, friend or colleague to review it for you. It's always good for another pair of eyes to take a look because it's hard to catch our own mistakes. Review a formatted business letter with information on what to include in each section of your letter. I’m writing to invite you to a networking session we are setting up for our computer science graduate students here at Hazelwood University. We’re focusing on IT companies and we think your company would be a perfect fit. It’s always well-attended and it’s a great way to fill any positions you have open. The event is scheduled for April 30th from 1 - 5pm at the Holland Hall Student Center. If you’re interested, please let me know and I can reserve a spot for you or your hiring manager. Feel free to email at myname@myemail.com or give me a call at 555-555-5555 if you have any questions or would like more information. Review business letter examples for a variety of business, professional, and employment-related correspondence, including letter and email message samples and templates.